They say charity begins at home – and in many ways too so do society’s worst ills – like racism. That’s why Show Racism the Red Card, an anti-racist education group, takes its message of strength and unity in diversity to every corner of people’s lives – to schools; to workplaces; and to local communities. And they do it through that most unifying British cultural institution of all – football. But football’s power to bring people together is now being co-opted by the forces of division. What first began as a seemingly innocuous group set up in the aftermath of last year’s London Bridge terrorist attack, the Football Lads Alliance has now revealed itself to be a far-right breeding ground of Islamophobia and racial hatred. Its supporters took to the streets in tens of thousands to rally behind former English Defence League (EDL) leader Tommy Robinson at a march earlier this year. Known right-wing extremists gave speeches, and violence and intimidation against counter-protestors has routinely broken out at their events. 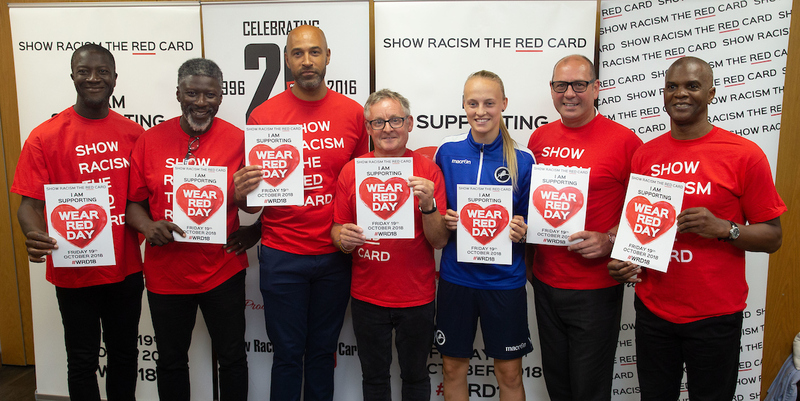 Show Racism the Red Card’s (SRtRC) chief executive Ged Grebby highlighted the dangers of this nascent far-right group now infiltrating football. “What we’re trying to do is warn people,” he told UniteLive at SRtRC’s Wear Red Day launch event, held at Unite’s headquarters last night (September 5). But for Ged and Show Racism the Red Card, fundamental to tackling the Football Lads Alliance (FLA) is tackling racism at its root. “The FLA is an expression of the times – it’s grown out of the Islamophobic and xenophobic thinking that’s dominated in the aftermath of 9/11. It can be traced back even further to the fall of the Soviet Union – the need for another bogeyman. Brexit has seen a rise in racism too but all the symptoms and conditions were present way before then. Tackling this “racism throughout society” is SRtRC’s driving force – and in the 22 years of its existence it’s done so spectacularly. Founded in 1996, the organisation brings anti-racism training to young people and workers at schools and workplaces throughout the UK, with many current and former footballers helping to deliver and support the training sessions. Every year, SRtRC reaches out to about 50,000 people. Unite has long supported the organisation, Unite general secretary Len McCluskey explained. “As a football fan to me it’s fabulous to use football as a vehicle to talk to young people about racism,” McCluskey, who’s attended many of the school sessions SRtRC delivers, said. “[SRtRC] takes the message of hope and opportunity to displace fear in our communities,” he said. “The far right are trying to get a presence back into football terraces and there’s no place in football for racism or fascism or hate. But the transformative work that SRtRC tirelessly does year in and year out is now under threat – in an era of austerity cuts, the group has lost all government funding. But thanks to support from the trade union movement among other supporters, Ged said the organisation has against all odds continued to survive without laying off any staff or cutting its services. Instrumental to SRtRC’s continued growth is its annual Wear Red Day, a national day of action which encourages schools, businesses and individuals to wear red and donate £1 to help facilitate the delivery SRtRC’s education programme. Now in its fourth year, Wear Red Day will be held on October 19. The Wear Read Day 2018 (#WRD18) launch event last night welcomed several former football legends, including Arsenal’s Perry Groves and Paul Davis, Chelsea’s Paul Elliot, ex-Watford player Jason Lee, Fulham’s Terry Angus and former Charlton player Paul Mortimer, among others. Also in attendance was Riva Casley, 19, Millwall Lionesses’ newest player. Riva urged everyone to get involved in Wear Red Day and support SRtRC’s work. Riva told UNITElive racism is present everywhere, even places you wouldn’t expect it. Chelsea’s first black captain, Paul Elliott, who now serves as chair of the FA’s inclusion advisory board, last night hailed the enormous power football wields as a vehicle for change. “I look at the power of football at what it does, in a collective and collaborative way to unite communities; to break down barriers; to challenge issues like discrimination and bring people together; to build social mobility and community cohesion,” he said. Elliott denounced those criticised hosting this year’s World Cup in Russia, a country known for its racism, homophobia and xenophobia. Unite EC member, bus driver and Millwall supporter James Mitchell, who has personally experienced racism as football supporter, also spoke of the unifying force of football. “We as black people for so long have wanted to go to football; to be a part of football,” he said. “But sometimes especially on the terraces going to Millwall, it was a scary place. Mitchell said Show Racism the Red Card’s work goes far beyond football – which is what makes supporting the organisation and others like it so important. Find out more about Wear Red Day on October 18 and how you can take part. And you can donate to Show Racism the Red Card online here.